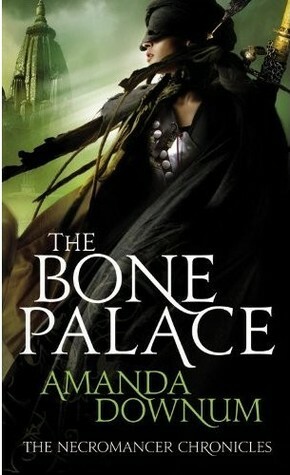 The Bone Palace is a better book than the first one, I think; more of the characters were compelling to me, and the magic all felt like it fit together better. Isyllt’s magic didn’t fit, somehow, with the world of river spirits and djinn, with the desert magic and the heat. Which makes sense: she’s out of her own world there. It’s hard to glimpse whether there’s a larger story behind the politics and magic — it feels like there should be; there’s plenty of history and geography underlying the world. But it’s hard to tell where it’s going. When I last read it, the third book wasn’t out, so that might solve some of my questions. But the first two books together feel odd; not quite the same story, not even quite about the same characters. Isyllt’s a main character in both, but Savedra steals this one entirely. I love the magic, love the history, love Savedra. The only thing I’m not sure about is, again, some of the cultural stuff. For instance, Savedra is trans; the story uses the term hijra, which fits badly with the Russian-sounding words floating around, the Greek names, and which might not even fit with the actual concept of hijra in our world. I can imagine people being annoyed that hijra in Downum’s world are mostly prostitutes, for example. All the same, I love Savedra — the complex relationship between her and Nikos and Ashlin, the fact that she’s a royal concubine and she navigates that world so carefully and protects her loved ones, while not feeling brave or strong. She just does what she has to do, for Nikos and Ashlin, for her family. And it works. Isyllt and Kiril? I don’t hate that relationship, but it just doesn’t breathe for me like Vedra’s life.